January was always traditionally the month when Acrobat came out with its latest series of British Hit Parades collections, but that process was halted by the change in the copyright laws a few years back which meant that the series had to stop at 1962. 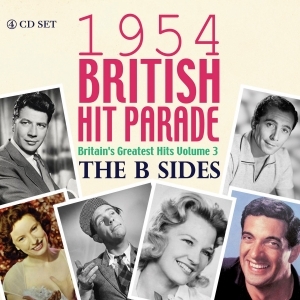 However, with several years of our British Hit Parades B sides still to be compiled and released, along with the development of our series of 4-CD sets in the America’s Greatest Hits, Greatest Country Hits and R&B Hits Collections for each year in the 1950s, early ‘60s and also back into the ‘40s, we still like to have a chart-focused release in January as well as releasing collections using these themes throughout the year. We have released four 4-CD collectionss over the last few years which are complete collections of the records in certain landmark Billboard charts – ‘The First US Top 100 November 12th 1955’ (ACQCD7062), ‘The First US Hot 100 August 1958’ (ACQCD7083), ‘The First Hot 100 of the '60s’ (ACQCD7097) and . This one is the Top 100 in the week that Elvis Presley’s ‘Heartbreak Hotel’ went to No. 1, a significant threshold moment in pop music. and “The 'Heartbreak Hotel' Top 100” (ACQCD7122) each comprising all the records in the Top 100 for the date in question. This collection commemorates the 60th anniversary of another significant musical landmark, and comprises the complete Top 100 on the date when Buddy Holly, Ritchie Valens and The Big Bopper died when their light aeroplane crashed near Clear Lake, Iowa. The event later became known as “The Day The Music Died” after singer/songwriter Don Mclean described it in this way in his 1971 No. 1 hit “American Pie”. It’s a fascinating musical snapshot of a moment which lingers long in the memory of pop fans. This great-value 113-track 4-CD set comprises just about every record that made the US R&B Top 15 during 1961, and it’s a really interesting and high class collection, By this time, the R&B scene had evolved considerably as the rock ‘n roll scene had matured and Tin Pan Alley had marketed its teen-oriented offshoots, and there was an exciting feel to the charts, with substantial crossover into the pop charts through artists like Ben E. King, Ray Charles, Brook Benton, The Miracles, Aretha Franklin and The Marvelettes. There was also a significant weight of other records from the increasingly powerful Motown, Tamla and other labels producing material which would have a significant influence on emerging talent across the pond in the UK, like The Beatles, who absorbed some of the songs in this anthology into their repertoire. The releases are featured in our New Releases section, where you can click through to full details of the products. Through the year, we will be releasing more similar collection, especially filling in gaps in our catalogue with America’s Greatest Hits 4-CD sets for years in the ‘40s and early ‘50s, along withGreatest Country Hits and R&B Hits for various years during the post-war decades through to 1962 where we don’t already have collections available. We know from e-mails we get from collectors that, alongside our regular single-artist anthologies, these chart-based products provide a particular kind of enjoyment, and we appreciate your continued support for what we do.